Our electropolishing systems ensures repeatable, micro-tolerance surface roughness finishing for industrial, medical device and aerospace metal parts. Stainless steel passivation/electropolishing systems produce a bright, corrosion-resistant, highly-polished surface; reducing the expense and surpassing the quality of standard mechanical polishing. 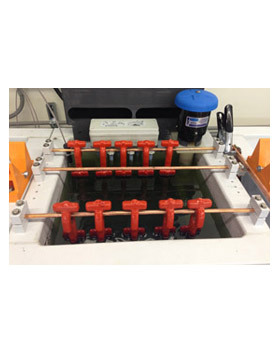 All electropolishing equipment can be made with 12V, 24V or 48V from 10-1000 amp rectifiers and have host of options: digital timers, temperature controls, etc. Most tanks are polypropylene or stainless steel construction and can be made into any size from 1 gallon to 3000 gallons. Call us for a solution to your electropolishing equipment application.